Weekday mornings are hectic in our house. We have an overzealous 2 year old who wants to get up at the crack of dawn, and a reluctant 5-going-on-13 year old who refuses to get out of bed. Trying to get everyone up, washed, dressed, fed, and at their respective schools/places of work is a chaotic challenge. By the time the weekend rolls around, we like nothing better than to slow down and enjoy some time together. It also gives us a chance to eat breakfast together and really savor the flavor of the foods we are eating. 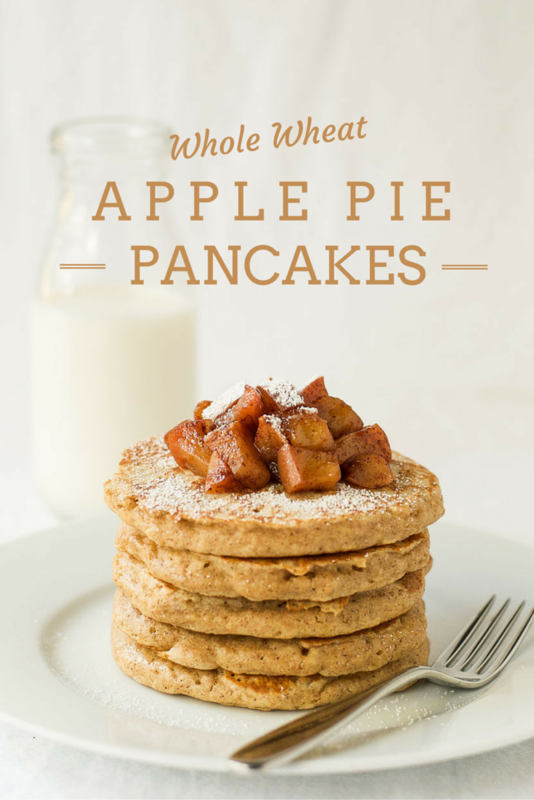 So this morning, I made these delicious whole wheat apple pie pancakes for us to enjoy together as a family. 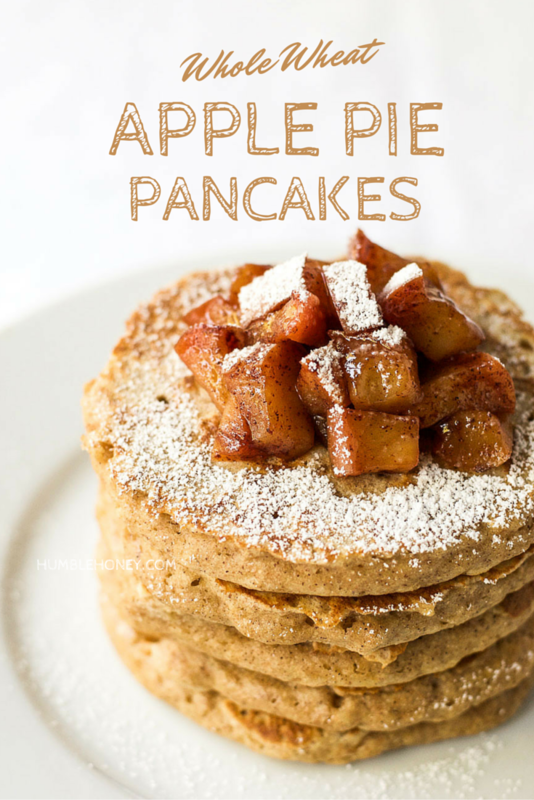 These apple pie pancakes also made me think of the upcoming National Nutrition Month at the Academy of Nutrition and Dietetics. For those of you who don’t know, the Academy is the world’s largest organization of food and nutrition professionals who hold undergraduate and advanced degrees in nutrition and dietetics. Every year they have a National Nutrition Month in March, during which they draw attention to the importance of making informed, healthy food choices. This year the theme is “Savor the Flavor of Eating Right”. The idea is that we should take time to enjoy the flavors, traditions, and social experiences associated with food. It is not only what we eat that is important, but also how, when, why, and where we eat. The theme is meant to encourage mindful eating of nutritious and flavorful foods. So this morning, in preparation for National Nutrition Month, my family savored the flavor of these tasty, nutritious, apple pie pancakes. They were a big hit with everyone. And I made a double batch so that I could put some in the freezer for the more chaotic weekday mornings. 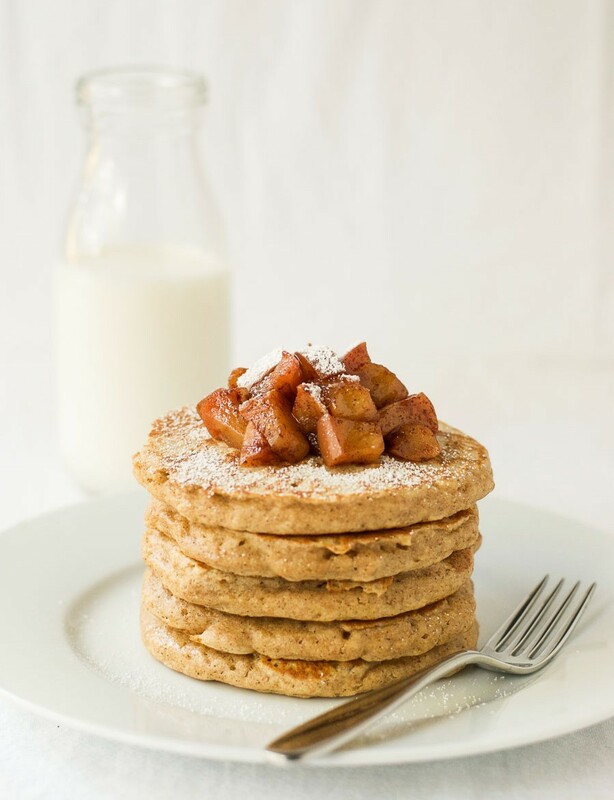 Tasty apple pie pancakes made with whole grain flour and topped with delicious cubes of sweet sautéed apple. In a medium bowl, mix the milk and cider vinegar and put to one side. In a large bowl, combine the flour, sugar, baking powder, baking soda, cinnamon, and salt. To the milk mixture, add the egg, melted butter, and vanilla extract, and whisk well. Pour the wet ingredients into the dry ingredients and stir until just combined (don’t over mix or you will get tough pancakes). Gently fold the grated apple into the mixture. 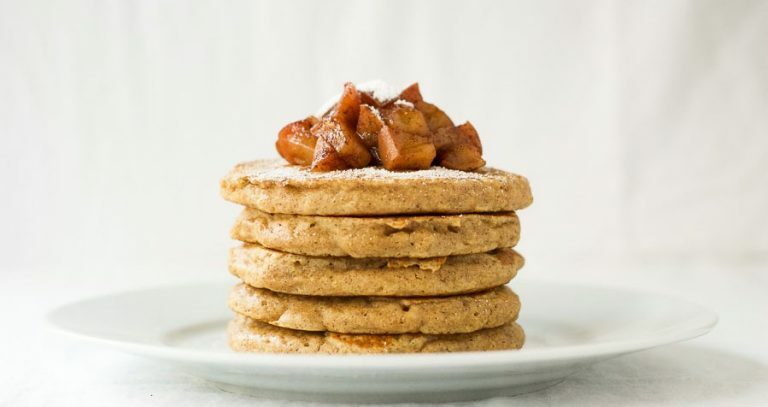 Heat a skillet over a medium heat, add a touch of vegetable oil, and pour about ¼ cup of batter per pancake onto the heated griddle. Once bubbles start to surface, flip the pancake and cook for another minute or two, until both sides are lightly brown. Meanwhile, for the topping, place the butter in a pan over a medium low heat. 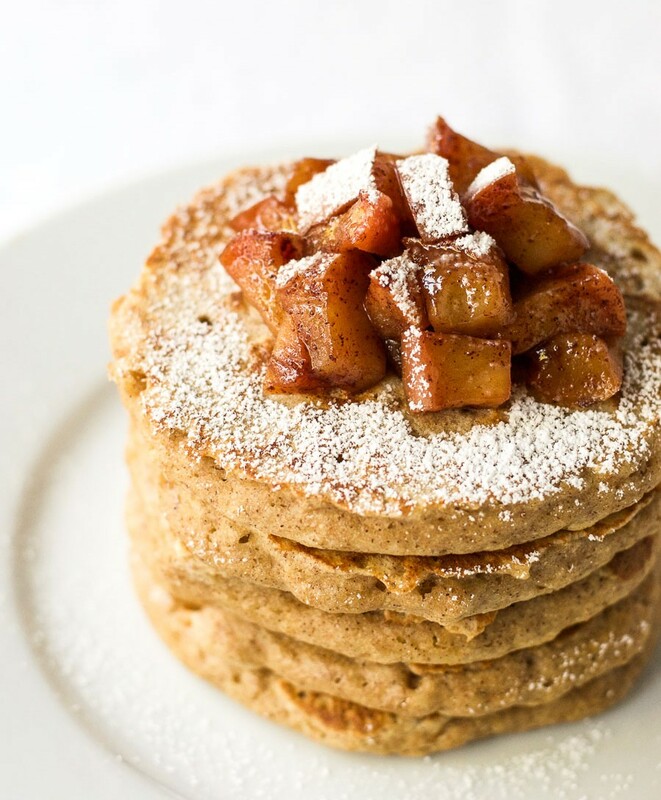 Once it has melted, add the apple, sugar, and cinnamon, cover, and cook gently for 5 to 7 minutes. 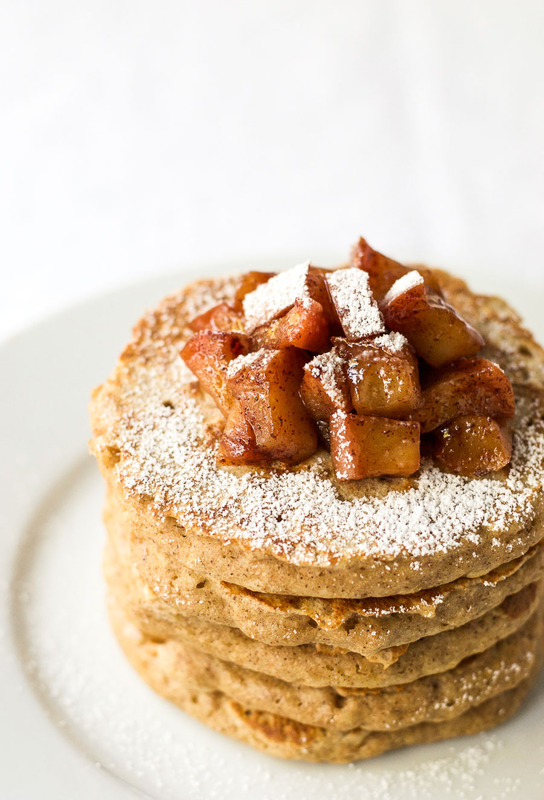 Serve the pancakes with a spoonful of the sautéed apple. Great photos too, thanks for posting! 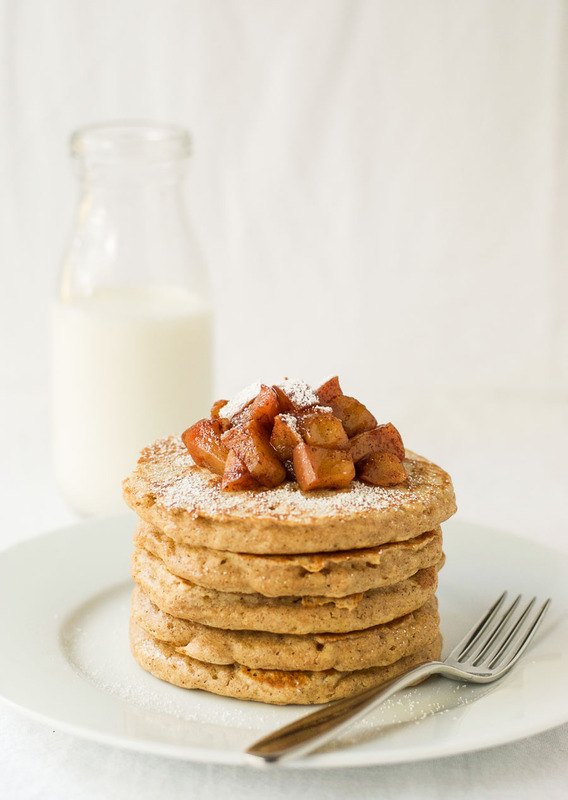 Made these for breakfast today and they were DELICIOUS! Great recipe. Thank you Evi 🙂 That means a lot coming from you and your beautiful recipes. I am SO excited to try this recipe! 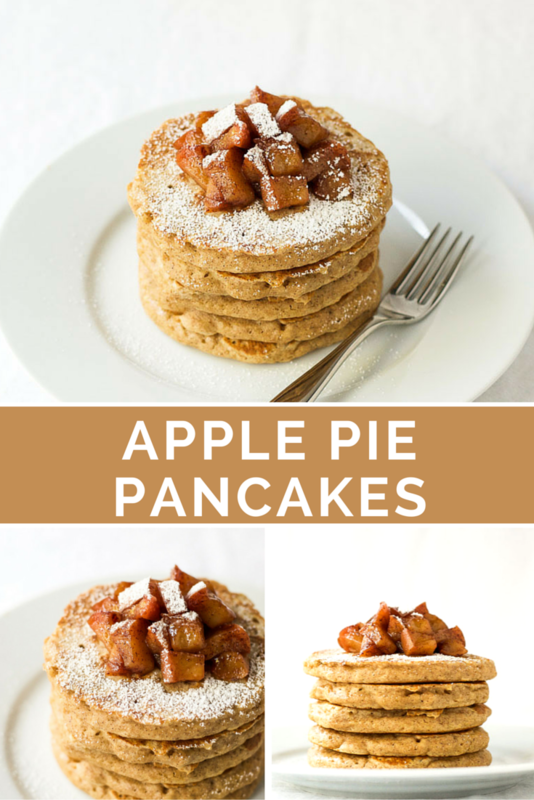 We are big pancake lovers in this house and I literally cannot buy enough apples each week. lol So this recipe is right up our alley. Thank you for sharing it with us! Hi Sammi. Thank you for your comment. I hope you love them as much as my family did. If you try them I would love to hear what you think.